I know I gush a lot on this blog, but there's a lot to gush about when you're talking about theater in Minneapolis/St. Paul. No more so than when you're talking about Ten Thousand Things, the theater company that takes their work out into the community, to people who don't normally have the opportunity to see theater (prisons, homeless shelters, community centers, libraries, etc.). If you're a theater fan who lives in the Twin Cities and you've never seen a TTT show, you really must go as soon as possible. I guarantee you're in for a theater experience unlike any you've ever known. With full lights, minimal sets and costumes, a small intimate space, and nothing but a few feet of air between you and the actors, it's as raw, immediate, authentic, and thrilling as I've ever known theater to be. It's a strange thing; you're more aware that this is make-believe because you can see everything that's going on with no illusions, so you know it's not real. But in a way, that makes it even more magical when you're completely transported into a new world purely through the power of collective imagination. Mere words cannot adequately describe it - you have to experience it yourself. Ten Thousand Things' current show is the Shakespeare comedy As You Like It (paid performances continue weekends at Open Book through March 11, as well as a number of free performances throughout the area). I saw this play several years ago at the Guthrie, but I don't remember a whole lot about it other than the trippy 60s vibe of that production and the inclusion of music (always a plus in my book). But it wasn't hard to get into the story and the language in the hands of TTT. 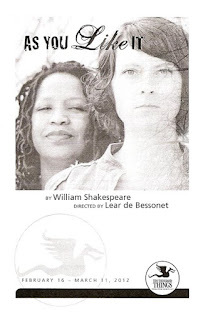 As You Like It is your typical Shakespearean romantic comedy, full of disguises and mistaken identities and banishments and declarations of love and hate, with everyone appropriately coupled off and happy at the end. But the journey to get there is pure delight. Maggie Chestovich is the slacker in the group - she only plays one character. ;) But in her defense Rosalind is more or less the main character, and she also dons the clothes of a man through much of the play so as to travel more safely in the forest after her banishment from the court. I've seen Maggie several times in TTT productions, and she's always fully present and real in her portrayal. The busy and talented Randy Reyes is Orlando, hopelessly in love with Rosalind and also banished from court by his greedy jealous brother. Randy also plays an old shepherd, which gives him the opportunity to ham it up in funny glasses and a hat. He's always entertaining in everything he does, and he's particularly good at engaging the audience here. As I've said before, I don't think there's anything Bradley Greenwald can't do - comedy, drama, and that voice! Whether singing or speaking, silly or serious, I love to listen to him. He plays a pompous wrestler, the cruel duke who banished his brother as well as the kinder banished duke, a lowly shepherd, and a "country wench" who hilariously delivers a calf. Pearce Bunting (the only member of the cast I hadn't seen before) does a wonderful job creating three vastly different characters who bear little resemblance to each other. He's the entitled elder brother of Orlando, a smart-talking clown who falls for the aforementioned country wench, and a friend of the banished duke mired in thoughtful and hopeless melancholy. Each one is a distinct character. Kimberly Richardson's roles are pretty diverse too. She's a frail old man who is loyal to his master until death, a stuffy and formal court messenger, and a silly country girl, each with a specific physicality that would tell us who she is even without the costume changes (which in some cases are very quick!). The sound by Peter Vitale is almost like a seventh actor in the cast. It's like a soundtrack for a silent movie, accentuating every emotion and movement without distracting from it. Some TTT plays are more serious, like last year's exquisite Doubt, A Parable. But with a comedy like this, they can be more relaxed and play a little more. If unexpected things happen, the audience is in on the joke and goes along for the ride. Artistic Director Michelle Hensley always introduces the show and tells a little bit about their experiences so far (for more information on that you can read the TTT blog, with commentary by Bradley Greenwald). She talked about how their audiences have been hungry. For laughter, for love, and for language. As You Like It is definitely just what the doctor ordered.